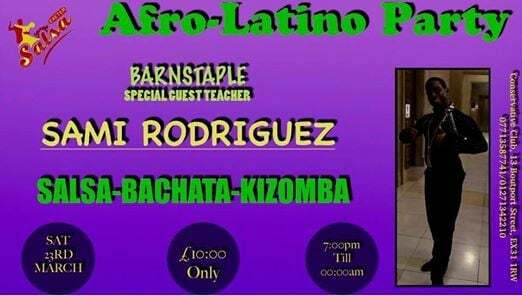 We are delighted to invite you to our first special SATURDAY Afro-Latino dance party and show with our special Guest Teacher all the way from London SAMI RODRIGUEZ at the CONSERVATIVE CLUB, 13 BOUTPORT STREET, BARNSTAPLE, EX31 1RW. If you want private classes please feel free to email us or call us so that we can book you in 1 to 1 or 2 to 1 and also arrange a convenient time before classes start. 9:45pm - 23:00pm: Dj Abes and Sami will be behind the decks to play the best and latest tunes of SALSA, BACHATA & KIZOMBA. There is free parking from 6:00pm, The Conservative Club is a fully license bar. Thank you and looking forward to seeing you.